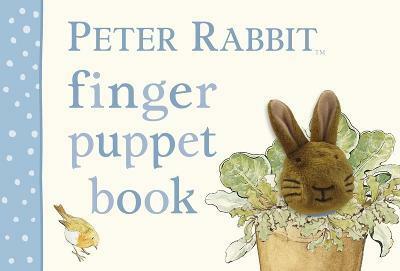 A finger puppet book featuring Beatrix Potter's classic character, Peter Rabbit! This simple counting book with a soft finger puppet of Peter Rabbit will really help adults to bring the pages alive. The Peter Rabbit puppet is cleverly stitched into the book so it can't get lost, and is integral to every page! A great fun read to share with very young children. Beatrix Potter is regarded as one of the world's best-loved children's authors of all time. From her first book, The Tale of Peter Rabbit, published by Frederick Warne in 1902, she went on to create a series of stories based around animal characters including Mrs.Tiggy-winkle, Benjamin Bunny, Jemima Puddle-duck, Mr. Jeremy Fisher and Tom Kitten. Her humorous, lively tales and beautiful illustrations have become a natural part of childhood. From the revenue from the sales of her books, Beatrix Potter bought a farm - Hill Top - in the English Lake District, where she later became a farmer and prize-winning sheep breeder. She launched the now vast merchandise programme by patenting the very first Peter Rabbit doll in 1903. The product range continues to grow today with licences around the world including baby clothing and bedding, nursery decor products and collectables. Upon her death, Beatrix Potter left 14 farms and over 4000 acres of Lake District farmland to the National Trust so that the place that she loved would remain undeveloped and protected for future generations to enjoy. Today Beatrix Potter's original 23 tales are still published by Frederick Warne, alongside a wide range of other formats including baby books, activity books and gift and sound books. Beatrix Potter is one of the world's best-loved children's authors of all time. From her first book, The Tale of Peter Rabbit (1902) she went on to create a series of stories based around animal characters including Mrs Tiggy-winkle, Mr Jeremy Fisher and Tom Kitten. Her humorous, lively tales and beautiful illustrations have become a natural part of childhood. A source of inspiration was the Lake District where she lived for the last thirty years of her life as a farmer and conservationist.